Seasonic S12 Energy Plus SS-650HT PCSTATS Review - Improved Efficiency or Lip Service? Improved Efficiency or Lip Service? With the power requirements of high end computer systems steadily climbing, users have to rely more on quality power supplies that deliver than ever before. It used to be that power supplies were the one thing along with the computer case that you could skimp on... but not anymore. While this has lead to an increase in the cost of power supplies, consumers are equipping PCs with better units that use less power overall. 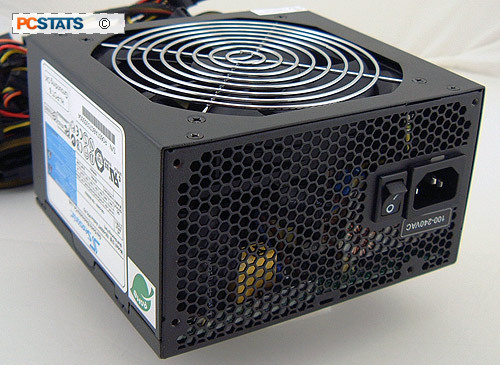 There are a lot of expensive power supplies on the market, and regrettably most are expensive due to gimmicks like flashy LED fans, see through PSU containers and detachable cables. In other words, useless junk. What you should really be looking for instead is for a power supply that has passed industry certification (like nVIDIA's SLI certified PSUs). Do your homework by posting in computer forums to ask the more experienced users what they think of certain models. This way you can get yourself a truly reliable power supply, not some pretty piece of junk. Seasonic has swept through the enthusiast community for good reasons. Its long history of manufacturing coupled with energy efficient designs is a winning combination. The flagship Seasonic S12 Energy Plus SS-650HT 650W has the high standard of '80 PLUS' to live up to, and as you saw, it had no problems doing so. While the amperage values on the side of the Seasonic SS-650HT might not seem as impressive as some other models, it's best to keep in mind that they're sustained levels. Put another way, this means the Seasonic S12 Energy Plus SS-650HT can deliver a true 650W of power while under load,not just during peak moments. The performance of the Seasonic S12 Energy Plus SS-650HT was excellent, and with an MSRP of $160USD ($180CDN, 90GPB) it is quite affordable too. If you're looking for a new power supply for that hot rod system of yours, make sure you check out what Seasonic S12 Energy Plus SS-650HT 650W has to offer! - Powerware 5125 1000VA UPS Review - Ready for Blackout Season? Pg 5. — Improved Efficiency or Lip Service?